I have quite a few tops that just need borders and that is something that will get rectified soon enough. Anyway, after playing around with fabrics, I do believe this will be the final selection. Now, to just get them cut and sewn on. 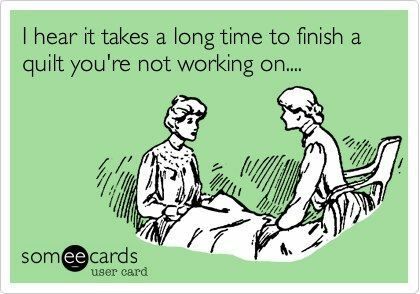 Oh procrastination .... go away! Wow--they are going to make an amazing quilt--love them! Oh, that colour for the border looks beautiful. Really pulls it together. Oh wow love this! I am going to have to do some placemats ore something so I can play with some tumblers.